Family & Relationships: Frances Uí Dhireáin (mother), Tadhg Ó Direáin (father), Jason O’ Connor (half-brother), Cuán O’Connor (nephew), Jay Óg (nephew), Minnie Uí Bhrádaigh (grandmother), George Ó Brádaigh (grandfather). 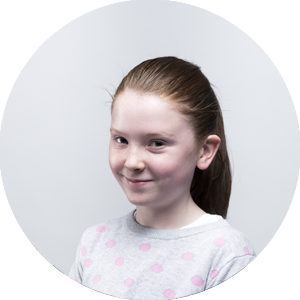 Áine is a mixture of characteristics – cheeky, sensitive, rebellious, thoughtful and manipulative. Although Áine is still young it is clear the apple does not fall from the tree, much to her father’s delight. Áine is a clever girl, she won a Spelling Competition in school in series 21. She’s also well able to work her tricks on her Mom and Dad.